Miley Cyrus was born on November 23, 1992 at 16:19 (04:19 pm) in Nashville, Tennessee/USA (36 N 10 /86 W 47) (source: AstroDatabank, Rodden Rating AA). As usual we will look at the standouts in her natal chart. Not to overwhelm you with information, we will only assess the horoscope of Miley Cyrus by looking at the factors that only have some meaning for her love life. There is quite a lot to tell about her natal chart though, but we'll still try to keep it to the essence. An emphasis on the Western hemisphere implies that her life is especially influenced, steered, by other people, by her partner(s), the external environment at large. She needs others to shape her life and help her in her own development. The downside of this predominant Western hemisphere is becoming attached and even dependent upon (the opinion of) others, being at the mercy of an audience, a public, the other(s) or partner. Uranus at a "critical degree" (15° Capricorn) conjunct the 9th house indicates an ambitious nature with high standards. Unexpected tragedies, disruptions or upsetting events may happen in far-away places that force some kind of separation of people and/or property. 15° Capricorn is a degree reflecting "the cry for love", a topic that may preoccupy her. In that way, she has a public message because of the involvement of the 9th house of publicity and the breaking up (Uranus) of limitations and boundaries (Capricorn). The stellium in Scorpio points to intensity, above all. Scorpio often lives in some extremes and because the stellium is also posited around her 7th house cusp of relationships, partnerships and other people (her audience), she lives this intensity especially in her relationships (at large), with her audience. This is confirmed by the tight MO=PL/AS midpoint that we delineate in a second. Because Scorpio is the sign of reversals, her relationships always transform profoundly from one level to another and at times in an extreme way. The tight Moon-Mercury conjunction in Scorpio is close to her Descendant and suggests the need and urge to talk to or vent her emotions to an audience, a public, others (her partner or husband inclusive). However, don't be mistaken, people with the Moon in Scorpio are EXTREMELY secretive about their private life. Combined with the Sun in the 7th house of relationships, she wants to show herself physically to others (the Sun represents the own physical body). It also represents creative self-expression (the Sun) in a public way, before an audience (the 7th house). Needless to say, this stellium and the position of the Sun clearly point to her as a performer, in front of an audience, a public (physically and by means of her voice)! The stellium in Capricorn, points to the importance of setting boundaries and loving some formalities and traditions too (after all, Saturn is the highest planet in her chart too). Esteem, reputation, status and accomplishments are very important to her. The Venus-Uranus conjunction in Capricorn suggests a free spirit in matters of love. From our own experience we have learned that people with a tight natal Venus-Saturn semi-sextile are very loyal to their partner(s) and may experience lasting love bonds. Venus/Jupiter because Venus is square Jupiter (the dispositor of Jupiter), Venus is in the 9th house (mundane ruled by Jupiter) and Jupiter is in Libra (ruled by Venus). Most Venus/Jupiter connections bring wealth, one way or the other. The native tends to put the lover/husband on a pedestal and there is lots of admiration. Often, the native expects the partner, lover or husband to be a savior who will solve all problems and issues so not to be responsible for the issues in life or to lower the own responsibilities in life. It's a connection that shows lots of protection but this does not prevent divorces or other issues in matters of love and romance. Moreover, it increases the tendency for love triangles (which is not a problem or an issue when a couple opts for open relationships). Love has many styles and ways of expression! Saturn/Uranus because Uranus is in Capricorn (ruled by Saturn), Saturn is semi-sextile Uranus and Saturn is in Aquarius (ruled by Uranus). This analogy is a highly ambivalent or split one and the native is continuously positioned between two choices, two opposites that need to be blended. She may always feel between the hammer and the anvil, between opposing or conflicting or contradicting duties, traditions, choices, etc. In many instances, this connection also reflects toggle relationships (on-off, on-off, on-off,...). Jupiter/Saturn because the ruler of the 9th house (mundane ruled by Jupiter) and the ruler of the 10th house (mundane ruled by Saturn) are in mutual reception and Jupiter trines Saturn. This is the connection of curiosity and the will to learn and understand things and gain insight. Often, this connection suggests health issues with the liver. Saturn and Uranus are in mutual reception (because Saturn is in Aquarius, the sign ruled by Uranus, and Uranus is in Capricorn, the sign ruled by Saturn). Because both planets rule the houses 9 and 10 (the ruler of the 9th house is posited in the 10th house while the ruler of the 10th house is posited in the 9th house), these houses are inter-connected too. Planets in mutual reception point to exchange status and show help and/or support. When the houses 9 and 10 are related, the career almost always is linked to foreign countries, publicity, spreading wide and far. She may deal with foreign managers, be more known in other countries than her own. Publicity affects the career (for good or ill). Because the 9th house is also the 12th house of the 10th house, she may face some career down-time or career-related deceptions now and then. The Ascendant at 28° Taurus denotes wealth. Numerous people with this Ascendant accumulate money, possessions, in whatever way, especially when confirmed by other astrological patterns or configurations. 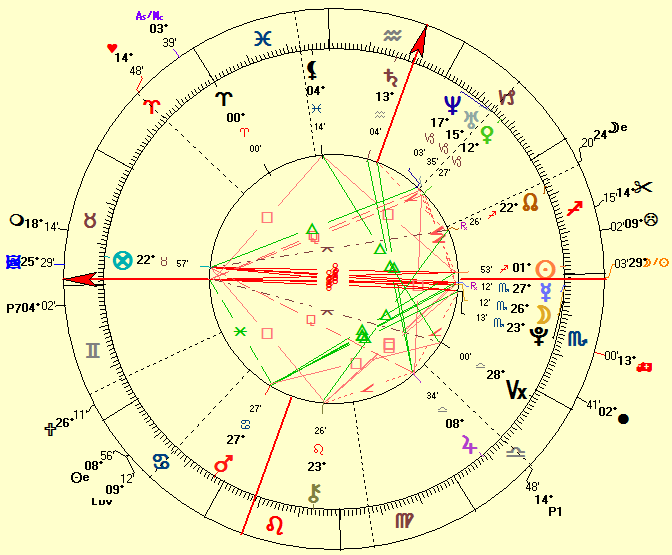 In Miley Cyrus' natal chart this is confirmed by the Jupiter-Saturn trine, the Venus-Jupiter square, Jupiter and the MC in trine at the same numerical degree and the angular Sun as well. Miley Cyrus has long been romantically linked to Australian Liam Hemsworth (born 13 January 1990). They "met" while filming the movie "The Last Song" in June 2009. In November 2009, Miley Cyrus calls Liam her best friend without confirming or denying that they were dating because she wants everything to be very private. On March 7-8, 2010 she confirmed Liam was her "boyfriend" and they had a relationship. The album "Can't Be Tamed," which was released in June 2010, was a whole lot inspired by Liam Hemsworth. In August 2010 they split because, reportedly, Liam Hemsworth cheated and because of Cyrus' hectic work schedule but in September 2010 they were back on. Reportedly, they had split again in November 2010 but were together again in March 2011 although "taking it slow." From December 2011 on, they were seen attending events both together again. Miley Cyrus confirmed in June 2012 in a statement to People magazine that she and Hemsworth were engaged but rumors went they split again in early 2013. Miley Cyrus unfollowed Hemsworth on Twitter in September 2013 and her rep confirmed that they had broken off their engagement. In November 2014 she made waves when she was spotted kissing Patrick Schwarzenegger, son of actor and former California Governor Arnold Schwarzenegger, at a University of South Carolina-University of California, Berkeley, football game. Reportedly, she and Patrick Schwarzenegger broke up in April 2015. In October 2015 Liam told a men's journal that his relationship with Miley Cyrus was not a fling and actually was an important part of his life, and always will be. In November 2015 Miley Cyrus had helped Liam Hemsworth adopt a 6-month-old puppy. During the 2015 Christmas-New Year period Miley and Liam met again. In January 2016 she reportedly spent time with Hemsworth's family in Australia and was seen with Elsa Pataky, the wife of Hemsworth's brother Chris Hemsworth. The time spent in Australia and with Liam Hemsworth's family reportedly helped their relationship. In January 2016 the couple planned to move back in together and get married, which resulted in rekindling their relationship in March 2016. In May 2016 Liam confirmed to another men's magazine, he and Miley Cyrus were back together again. In July 2016, Miley Cyrus got a tattoo on her left upper arm of a jar of Vegemite that fans think was in honor of Liam Hemsworth. Miley and Liam were engaged again in October 2016. In May 2017 Miley Cyrus talked about her new album and single, inspired by Hemsworth. In November 2017, the pair appeared to wear wedding rings on the 4th finger. On November 13, 2018 their Malibu (California) house burned down in the Woolsey Fire. Miley Cyrus and Liam Hemsworth tied the knot on December 23, 2018 during an intimate low-key wedding at her Franklin home in Tennessee. We did not rectify her natal chart though but we suspect her time of birth is quite accurate. What has Astrodamus to tell us about her future (love) life? Click here to download her Astrodamus predictions till 2050.